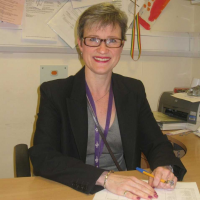 Dr Stephanie Munn, BSc, MBBS, FRCP, was appointed as a Consultant Dermatologist to Bromley Hospital Trust in 1999. She has worked for BUPA wellness since 2013 and is currently the clinical lead for dermatology within BUPA health clinics. She has considerable management experience having been the skin cancer lead for the NHS trust and the inaugural chair of the SELCN skin TWG from 2003-2005, clinical director for ambulatory services in Bromley hospital trust from 2008-2010 and clinical lead for dermatology for South London Healthcare Trust when the trust merged in 2010. She takes a keen interest in clinical governance and instituted network guidelines for melanoma and a process for network wide audits within the tumour working group, was a skin cancer peer reviewer and has set up governance processes for the dermatology service within BUPA clinics. She left the NHS at the end of 2014 to spend more time with her family and to be able to concentrate on helping Bupa develop an on- site dermatology service in the corporate sector, as well as expand their dermatology service into Bupa centres across the UK.